Barney A488693 — ADOPTED 2/2/2008! Barney was adopted by a retired military man and his family with four kids. They were drawn to him by his cage spinning, so I guess it's a good thing we never broke him of that habit after all. If there were a football team for dogs, Barney would be the star quarterback. Athletic, rugged, confident, and a bit of a ladies man, Barney loves a good game, though he prefers catching the ball to throwing it. This charming guy is always eager to spend more time with his human fans, adults and kids alike. Like any quarterback, Barney needs the leadership of a good coach to be the best team player he can be. The surefire way to motivate Barney to a game winning performance? It's no secret that this enthusiastic dog will do anything for a treat. Note: Barney likes having the respect due the captain of the team and has been known to get into shouting matches when other dogs start talking trash to him on the field. He may be happiest as the only male dog on your team. 1/9/08 update. 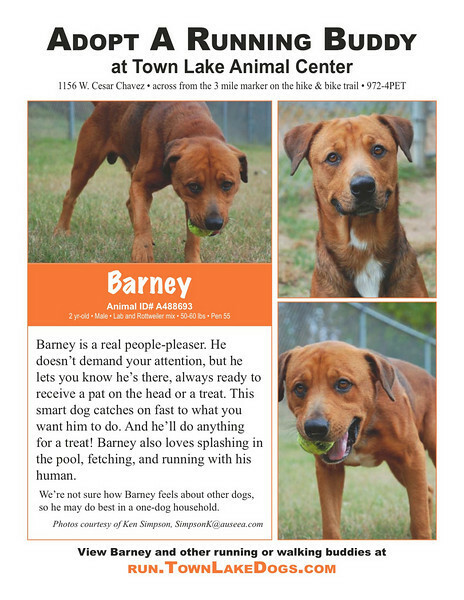 TLAC has offered to reimburse, up to $200, for training with Barney. 12/17/2007 update. Barney is now heartworm-free. He should be good as new after 6-8 weeks of rest and relaxation.